There are 500 million tweets being sent each day. 80% of Twitter’s users are accessing the app from a mobile device. Twitter have 100 million daily active users. 24% of all males on the internet use Twitter. 21% of all females on the internet use Twitter. There are over 67 million Twitter users in US. There are approximately 20 million fake Twitter users. 57.6 percent use it at least once per day. Twitter is valued at 10.38B as of Sept. 9, 2017. 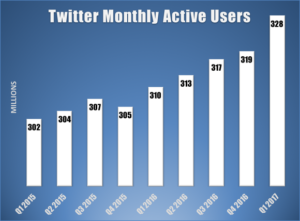 Twitter generated a revenue of 2.52 billion USD in 2016. 58% of top brands have more than 100K followers. 92% of brands Tweet more than once per day. 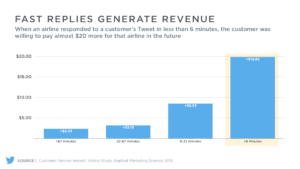 60% of users expect brands to answer a query within an hour. 76% of users are likely to recommend a brand if they’ve received friendly customer service on Twitter. 47% of users who follow a brand are more likely to visit the company’s website. eMarketer expects 67.2 percent of companies with more than 100 employees to be marketing on Twitter in 2017. 66% of Twitter users have discovered a new small or medium-sized business on the platform. 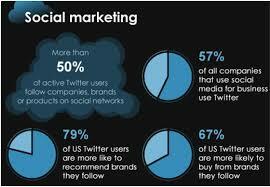 94 percent of Twitter users that follow small or medium brands plan to buy something from them. 69 percent of users that follow small or medium brands have purchased something that they saw from a brand on Twitter. 84 percent of shoppers on Twitter use the platform to search for deals, product reviews, and gift ideas. 84% of Shoppers on Twitter shop online nearly twice as much as non-Twitter users—3.6 times per month compared to 1.9 times. Moms are 67 percent more likely to research products on Twitter. Moms are 45 percent more likely to make purchases based on product information they find on Twitter. 68 percent have followed an SMB after seeing their Promoted Account. During the 2015 holiday season, Twitter users exposed to retail holiday campaigns on Twitter spent an average of 1.8 percent per household more than other shoppers. 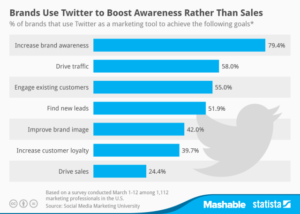 42% of Twitter users use Twitter to learn about products and services. 63% of people choose to follow Small Business to show their support. 42% of consumers learn about products and services via Twitter. 85% of users feel more closely connected with a small business after following them on Twitter.